So why in an isothermal and isobaric transformation is it different from 0? *We are taliking of real subtances here, nor ideal gases. That equation must be incomplete... or just misleading. Last edited by Screwed; Jul 21st 2018 at 09:05 AM. How would you describe the latent heat change? In many phase changes, and in many Chemical Reactions we consider P and T constant. But energy change is obviously non-zero and you really have some enthalpy difference. So that means the h(P;T) derivative notation does not hold all the information? I really need some guidance here. 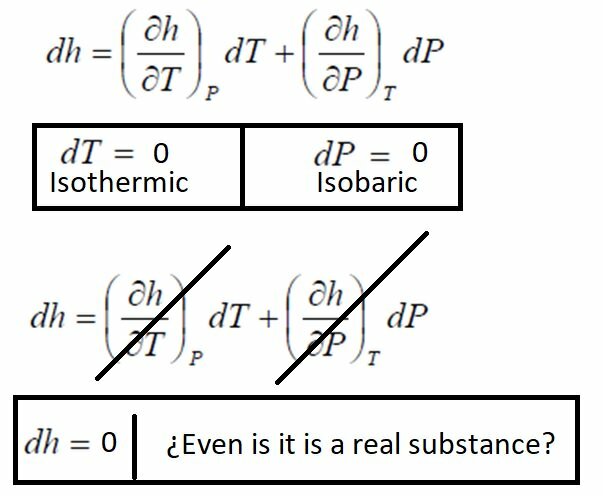 Yes latent heat change is an example of perhaps isobaric, but definitely isothermal change of enthalpy. So work is done by the volume change of the ice. I don't understand what the problem is? Last edited by studiot; Jul 21st 2018 at 01:18 PM. That is exactly the problem; dH=0 if I use that partial derivative equation... but there is work done by the change of volume, that do not appears on that equation. So, h(T,P) equation does not hold all the information, is plainly wrong because it returns a 0 value when we all know it should be non zero. It should be noted that though the PV in the definition term has the dimensions of energy, its physical interpretation depends upon the application. It is not always a work term.